Conejo Community Outreach was made aware of five-year-old Hazel's battle with Neuroblastoma through CBS reporter Kristine Lazar. In 2013, Hazel was diagnosed with stage 3 Neuroblastoma. She's beat it once, but sadly, the latest scans indicate that the cancer is back. The devastating news comes just before the beginning of her school year. While discussing the news with Kristine, we thought that a great community activity would be to have #hopeforhazel cards sent with words of encouragement! This led us to the creation of our #hopefor card campaign. 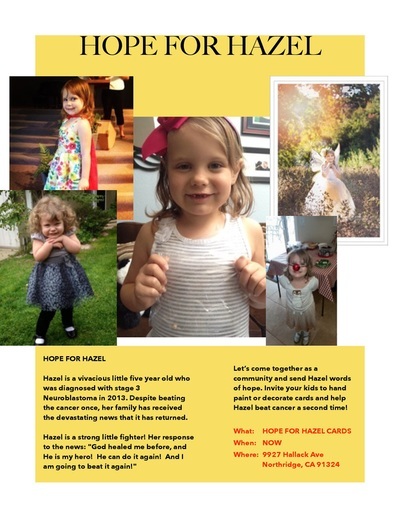 We are aware that there are many children in our community who battle with severe illnesses and diseases everyday, and that sadly, Hazel is one of many. If you know of a family or child in need of words of hope and encouragement, please email us at info@conejocommunityoutreach.com with the information. We will be creating small flyers and posting once a week, giving the opportunity for our community to come together and offer kindness and support to children in our community fighting brave battles. Cards can be sent at anytime, as these children have long roads ahead of them, not only in treatment. Thank you for participating in our #hopefor card campaign. Your cards will make a difference.